Size of this preview: 465 × 599 pixels. Other resolutions: 186 × 240 pixels | 372 × 480 pixels | 466 × 600 pixels | 596 × 768 pixels | 1,206 × 1,554 pixels. 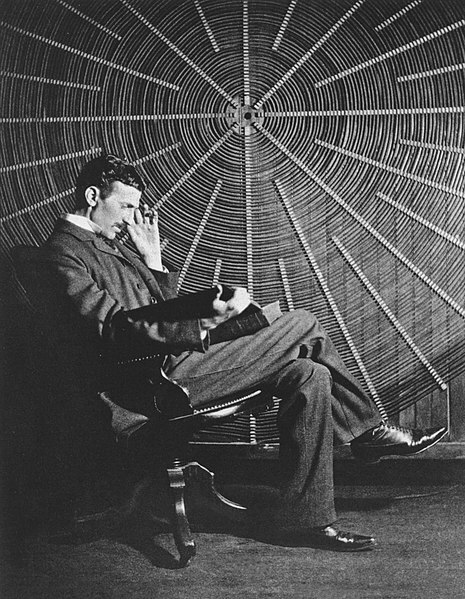 English: Nikola Tesla, with Rudjer Boscovich's book "Theoria Philosophiae Naturalis", in front of the spiral coil of his high-voltage Tesla coil transformer at his East Houston St., New York, laboratory. Originally published in "Tesla's Important Advances" in Electrical Review, May 20, 1896, p. 263. Credited in caption to Tonnelé and Co.